It looks like Treyarch is following in the footsteps of Infinity Ward in regards to the Call of Duty franchise and its implementation of co-op in Call of Duty: Black Ops. In a recent interview with the MTV Multiplayer blog, studio head Mark Lamia dropped the no co-op campaign bomb in a way that sounds strangely familiar. "Single-player is the epic, cinematic, seat-of-your-pants thrill ride that you star in. Then there's multiplayer, when you want to play competitive with your friends and really chisel and hone your skills and do that addictive experience. And then co-op is for when you want to have a blast with your friends, just sitting on the couch and having an awesome co-op experience. We're crafting unique co-op modes around that experience, but it is different than what people think." Ahhh, the old "ruin the experience" excuse. We've heard it before and we'll hear it again. Despite the negative vibe from that quote you could pick out a certain statement in it that sounds promising. Co-Op Modes. Plural, as in more than one. Technically there were co-op modes in Treyarch's previous game with their campaign mode and the insanely popular and fun Nazi Zombie mode from Call of Duty: World at War. Do they have the next great thing up their sleeve? 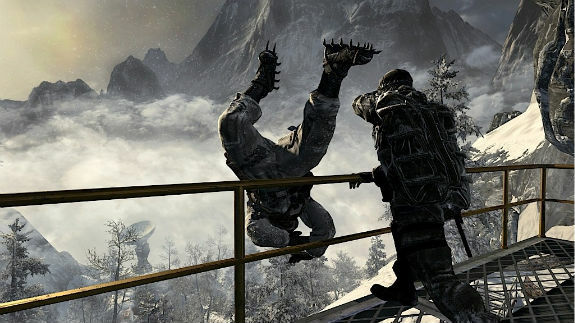 Or are we in for another Spec-Ops style mode similar to that found in Modern Warfare 2? To answer the second question, no, the co-op mode is not similar to Spec-Ops. To answer the first? Can we expect Commie zombies for the Vietnam era? Zommies? Again, Lamia won't say, but he did stress that the co-op modes will be unique and "awesome." You mean awesome like a co-op campaign? Page created in 0.3304 seconds.